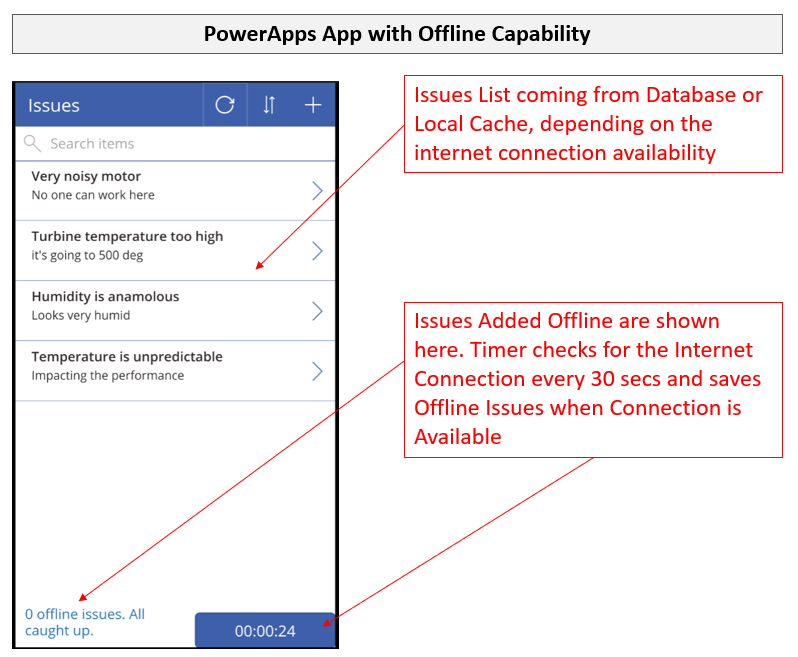 Do you want to build offline capabilities in your PowerApps app because your app users need to access some data or save some data even when they don't have the internet connection? This blog provides an example of building these offline capabilities in your PowerApps app. 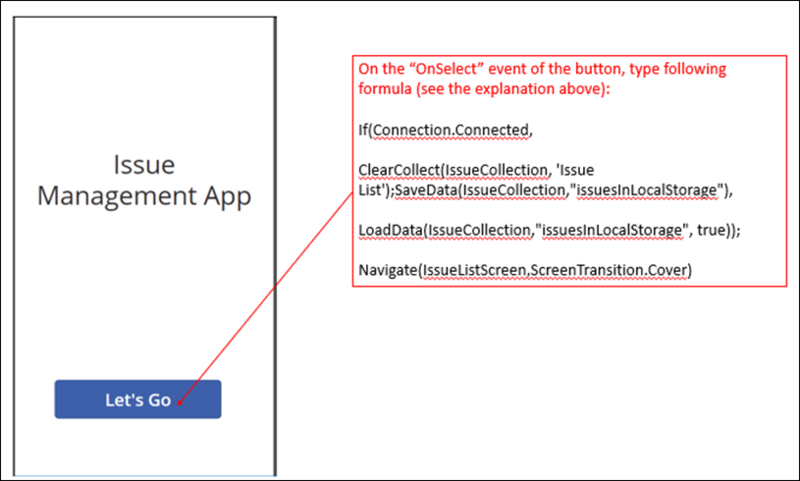 This article assumes that you already know the basic concepts of PowerApps like screens, controls, events, attributes, navigation etc. We'll will use all these concepts in this tutorial. The offline feature area is still under development and is not optimized for every offline scenario today. The functions to SaveData() to a local device and LoadData() from that device work best in their current implementation over relatively small quantities of data (e.g., dozens of text records in a table) that generally do not exceed 2MB. This is useful for some basic “offline” scenarios as well as to increase the startup performance of canvas apps by caching data locally. However, using this feature to save large amounts of data (e.g., saving thousands of rows in a table, or caching large images or videos) may cause errors or unexpected behavior with the current implementation and should be avoided. 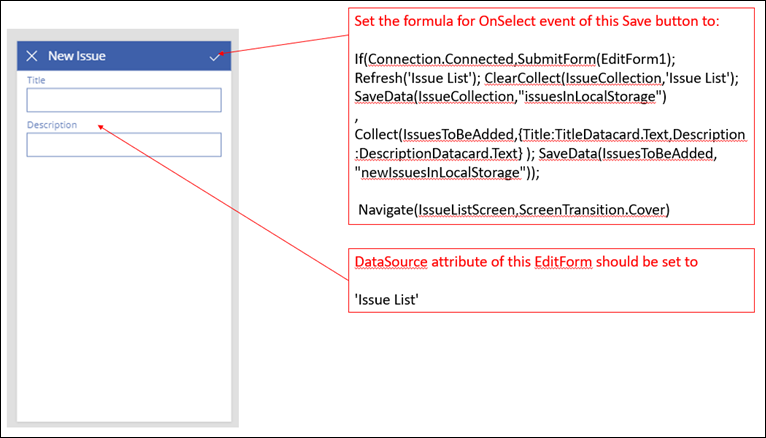 Also, the functions do not automatically resolve merge conflicts when a device returns to connectivity from offline – configuration on what data is saved and how to handle reconnection is up to the maker when writing expressions. We are working to expand the capabilities of offline apps to increase stability and size limits, and in the future to automatically handle decisions about what to save and how to handle conflicts. 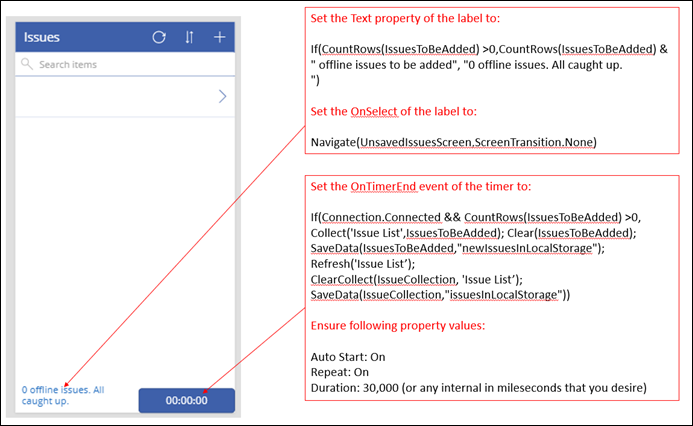 Stay tuned here and on the PowerApps blog for updates when they become available. For this blog, I’ll not get into conflict resolution scenarios e.g. allow offline editing of existing records and resolve conflicts with the edits done by other users on the same record. Implementing conflict resolution needs more work- e.g. you have to not only detect conflicts but also come up with a policy to resolve the conflict (auto resolution or user intervention). Conflict Resolution implementation would be easier to grasp, once you fully understand the offline capabilities described in this article. If there is enough interest, I’ll write another article covering the conflict resolution aspect as well. You can find finished version of the example app over here (msapp file is here and exported package along with CDS is here). For this app, I used CDS (Common Data Service) as the data source. However same concepts will apply to any other data source like SharePoint, SQL etc. If internet connection is available, fetch the data from the the database and put that in a collection (table in memory). Also, save this collection data to local storage of your device (local cache) so that we can use this cached data next time when the internet connection is not available (see next bullet). If internet connection is not available, fetch data from local storage of your device and use that to populate the collection. 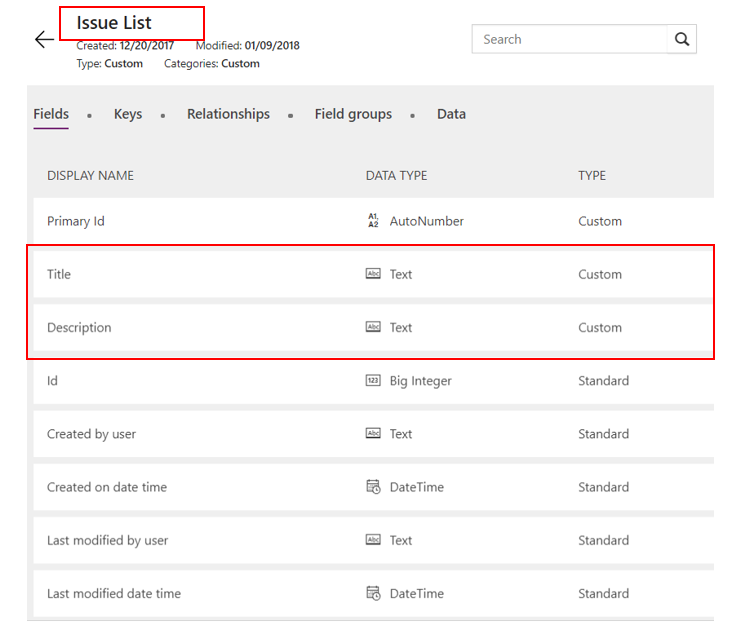 For this app, I created a very simple custom entity “Issue List” in CDS (Common Data Service) to capture issues with “Title” and “Description” as 2 custom fields. Note- I used CDS as the data source for my app. You can also use any other data source like SQL, SharePoint Online etc for creating similar table. Offline implementation concepts will be same. First screen in this sample app is a cover page kind of screen. On the click of “Let’s Go” button, we’ll check the internet connection via an object exposed by PowerApps called “Connection”. If internet connection is available (i.e. Connection.Connected is true), populate the local collection “IssueCollection” directly from the entity “Issue List” in the CDS database. Also, save it to the local storage (local cache) as “issuesInLocalStorage” so that we can use it as local cache when the internet connection is not available. If internet connection is not available, populate “IssueCollection” from this local cache. 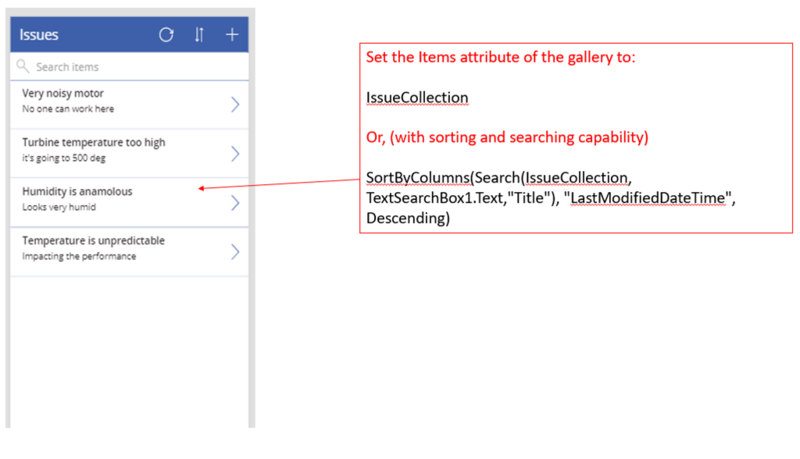 Finally, put the formula to navigate to the next screen where we’ll be using the “IssueCollection” collection as the data source (Items property) for the gallery to show all the issues. Note- I chose the option to do all this work in the OnSelect event of a button. You are free to use a different approach like doing all this work in the OnStart event of the app or OnVisible event of the screen. Now, on the next screen (“IssueListScreen”), insert a gallery and set the Items property of that gallery to “IssueCollection”. Show the Title and Description fields in the gallery. That’s it for the first requirement. Your app is now ready to show data directly from the data source or local cache depending on the internet connection availability. Test it by first opening the app and seeing the gallery data with the internet connection on your phone. Close the app and now turn the phone in the airplane mode. Open this app again and hit “Let’s Go”. You should see the issue list coming from Local Cache. Important Note- As of now, you can’t test the LoadData and SaveData in browser. You must use your mobile device to test that part. In the web editor, you might see the error for LoadData and SaveData. Please ignore that. Submit the form so that new issue is directly saved to the database. 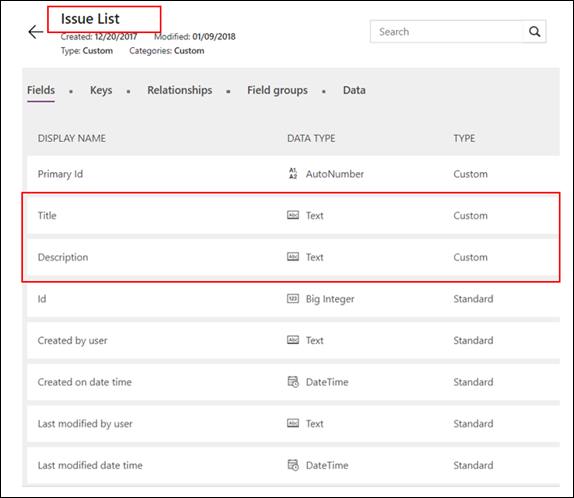 Refresh the “Issue List” data source and repopulate the collection “IssueCollection” with the latest data from “Issue List” data source (so that your local collection gets the last record added in the table). Add the offline issues to be added to a local collection called “IssuesToBeAdded”. In a later step, using a timer, we’ll keep checking the internet connection availability. As soon as the internet becomes available, we’ll try saving this local collection to the database and clear the local collection. Also save this local collection of offline “IssuesToBeAdded” to local storage as “newIssuesInLocalStorage”. This will be useful if the app is closed with some offline new issues to be saved. We’ll retrieve it from the local storage next time when the app is opened. Add a new screen to show these offline issues to be added (I call it “UnSavedIssuesScreen”). Add a gallery control and set the “Items” property of the gallery control to “IssuesToBeAdded”. With this, we are all set with saving the offline issues to database as soon as the connection is available and also getting a label to tell us how many issues are offline issues to be saved. Side note- Caching data is a good strategy for your app performance as well. You can learn more about performance tips for your apps in this blog. With this, we are done with building basic offline capabilities in your app. Without internet connection, your user can see the issues cached last time and even add new issues offline (to be synced later on internet connection availability). Keep in mind that your user has to open this app at least once and tap on “Let’s Go” once to ensure “Issue List” is cached once. Building offline capabilities makes your app even more compelling for your users (esp. mobile users traveling to places with spotty internet connections). 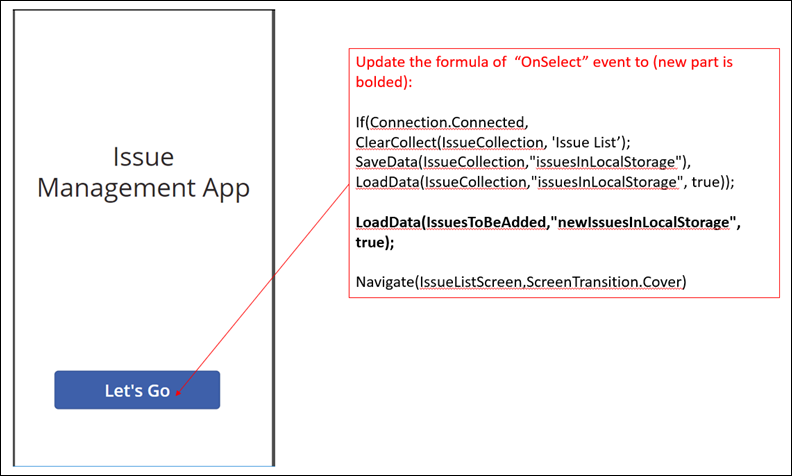 Hopefully this tutorial provided you necessary guidance to build these offline capabilities in your PowerApps app. We excluded Conflict Resolution requirements from the scope of this blog to make this article easily digestible. Most of the customer scenarios we heard don’t even need conflict resolution. However if many of you need help implementing conflict resolution requirements, let us know. We’ll be happy to do another blog on that topic. Happy App Building!